Rev. Jesse Jackson Sr. leads 2019 Selma to Montgomery marchers in prayer for the nation. (TriceEdneyWire.com) - This past weekend, political leaders from across the country gathered in Selma, Alabama, to commemorate “Bloody Sunday,” the 1965 march across the Edmund Pettus Bridge where peaceful demonstrators, attempting to cross the bridge, were violently driven back by Alabama State Troopers, Dallas County Sheriff’s deputies and a horse-mounted posse wielding billy clubs and water hoses to savage the crowd. The horrors played on TV sets across the country generated a national outrage that provided the final impetus for passage of the 1965 Voting Rights Act. In many ways, Selma is the birthplace of modern democracy in America, helping to secure the right to vote for African Americans and the young, and for providing the foundation for future battles for equality, including the equal rights of women. When former Alabama Gov. George Wallace was ill late in his life, I joined him for prayer. I asked him why he unleashed the troopers on the demonstrators in 1965. He said, “I did them a favor.” Wallace argued that the mob would have been much worse on the peaceful marchers. He never even considered that he might have used the troopers to protect them from the mob. That was a mentality that, as Dr. Martin Luther King taught, could only be challenged by nonviolent protest that demonstrated our humanity while demanding our rights. In the commemorative ceremonies this year, presidential candidates Sen. Bernie Sanders and Cory Booker, as well as Sen. Sherrod Brown and former Secretary of State Hillary Clinton were joined by many legislators and political leaders. 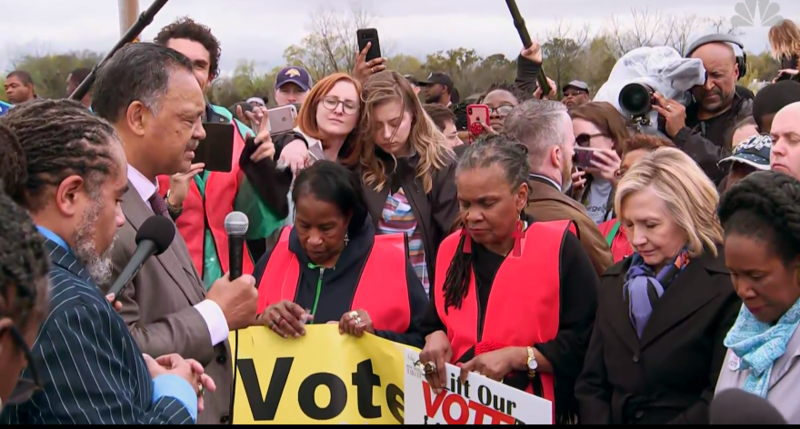 They sensibly called on participants to rise up again to challenge the revival of systematic efforts to suppress the vote and to push back against the outrageous Supreme Court decision in Shelby v. Holder. This decision gutted enforcement provisions of the Voting Rights Act, and opened the floodgates to a wave of discriminatory state laws meant to keep people of color from exercising their right to vote. There are laws that now require new forms of ID, voting districts have been gerrymandered and voter rolls purged. Laws now limit early voting and polling places have been closed or move without notice, and much, much more. The brave marchers in 1965 did their part for democracy, now it is up to us to defend it and extend it. At the same time, while Selma is the birthplace of modern democracy, it is in danger of becoming a prop. Selma is the ninth poorest small town in America and 40 percent of its residents live in poverty. It exemplifies the rural and small-town America that has been left out of the recovery. Democrats tend to see rural America as Trump country. Trump appealed to rural voters by stoking their fears and turning them against each other, but he has come up with no plan to help them. Trump offers only hate, not hope. The new Democratic majority in the House is in many ways the fruit of the sacrifices made at Selma and elsewhere. Democrats should see Selma and rural America as both an obligation and an opportunity. What’s needed is a comprehensive rural reconstruction plan, a modern version of what Franklin D. Roosevelt did when he built the Tennessee Valley Authority and modernized the Department of Agriculture, which literally electrified rural America. Today, the Department of Agriculture has the authority and the capacity to invest in water and sewage systems, modernize utilities, provide broadband to underserved communities, offer zero interest loans to community centers and subsidize affordable housing. What we need is a plan and a budget to get this done. House Democrats should make this a priority. Let’s honor those who sacrificed so much by repealing voter suppression laws. But let us also make Selma the birthplace of a new economic justice in rural America. Selma should be more than a symbol of past struggles; it must also become a beacon for a new hope.